All our lawyers have previous working experience with well-established law firms, legal departments or district courts. We are a compact firm that offers highly skilled legal expertise for a competitive price. Our seasoned lawyers have had extensive postdoctoral training in their area of expertise. Quite often our lawyers are requested to provide such postdoctoral training to others in the legal profession. We ensure personal and intensive contact when dealing with your case. We understand the rational and emotional elements, this is always a priority for us. Nevertheless, we remain objective and safeguard all your interests. Our job is to provide the best professional service possible. Nb. 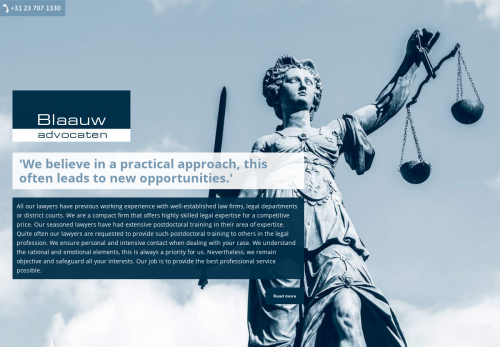 Derk Wiersum is no longer working at Blaauw Advocaten.